How to Transfer Music from iPod to iTunes on Mac - 2 Ways! You may want to transfer music from iPod to iTunes Mac for having a large music collection or transferring music to other devices. Or you have switched to a new Mac and want to sync iPod with new computer. But how do you make it? It's not easy to do it unless you know some tricks. But you can find your way here. The easy way to copy music from iPod to iTunes Mac is using iOS transfer tool, like iMyFone TunesMate. Well, it’s a perfect iTunes alternative that allows you to easily transfer music from iPod to iTunes Mac or sync iTunes music to iPod without deleting music. Both purchased and free music are well supported. Just download TunesMate free trial and follow below to transfer music from iPod to iTunes Mac. Step 1: Download TunesMate and install it on your Mac, then plug in your iPod. Step 2: On the home interface, you should see a button that says “Transfer iDevice Media to iTunes”. Click it, then click the “Start” button when it shows up. Step 3: Let the program scan through your files, then make sure to tick the box next to “Music”. Click “Start” again. With the above steps, all your iPod music will be transferred to iTunes. You also have the choice to selectively transfer music from iPod to iTunes Mac by heaing to "Music" tab instead. There you can select the songs and transfer to iTunes/Mac. It’s much more user-friendly as it will not erase your iPod any time. You can sync iPod to different computers or sync one computer to different iPods. All audio and video formats are supported. Files will be converted when transferring if not supported by iDevice. 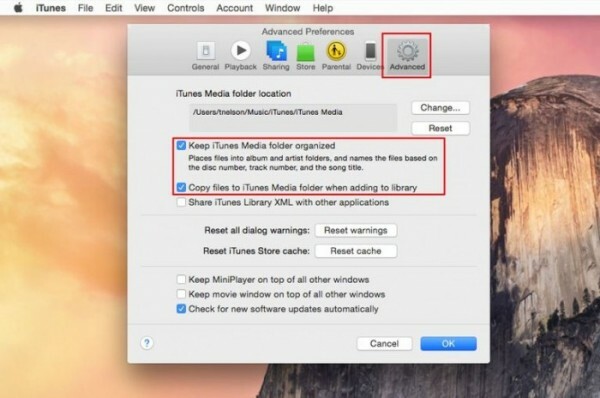 It allows you to transfer music/videos/files from iDevice to computer while iTunes does not. In addition, you can manage your music much more effectively using TunesMates’ intuitive interface. It will find and help you delete duplicate files. If you want a truly detailed view of the music on your iPod and you want real control over how your songs are transferred, TunesMate is definitely the way to go. Press and hold “Command” and “Option” keys at the same time while plugging in your iPod. Do not release them until you see your iPod recognized by iTunes. Confirm that your iPod is mounted in iTunes and your Mac’s desktop. Note: Ensure that your iPod will not sync with your iPod before connecting, or everything on your iPod will be removed. Go to “Finder > Applications > Utilities” and launch Terminal. Copy and paste “defaults write com.apple.finder AppleShowAllFiles True” and press Return key. 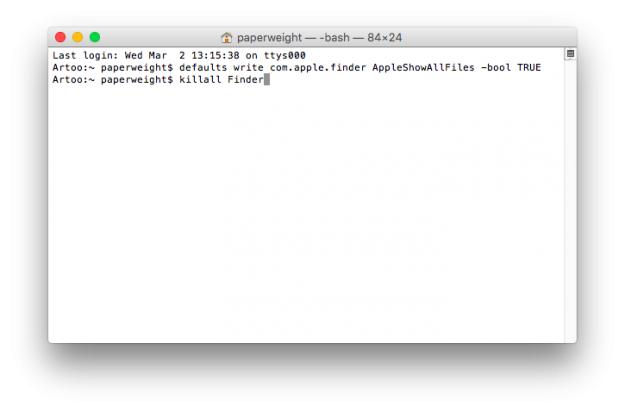 Copy and paste “killall Finder” and press Return key to stop and restart your Finder. 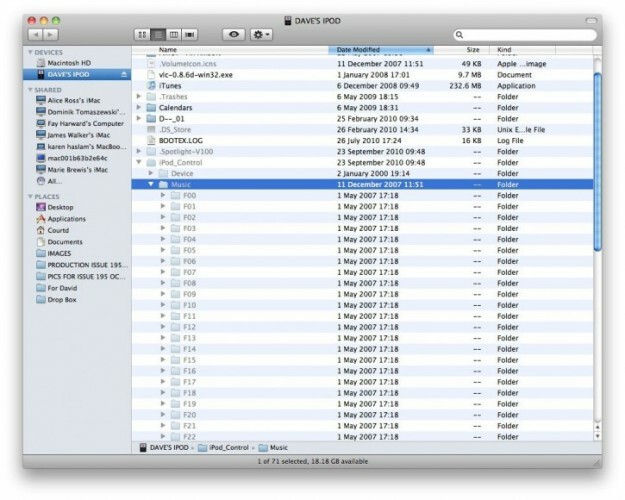 Launch Finder and click your iPod’s name in the side bar. Open “iPod_Control” folder and then “Music” folder. You can copy and paste the music you want to add to iTunes to wherever you like on your Mac. Note: You will be surprised to find that the folder or file names are not named in an easily discernable manner, but look something like F00 or TWVP.mp3. It is normal. When you add them into iTunes, iTunes can detect their built-in ID3 tags. They can be displayed neatly with track and info in iTunes library. On iTunes, go to “iTunes > Preferences” and then “Advanced” tab. Go to “File > Add to Library” and select where you paste your music. Click “Open” button to make it. It is more complicated to transfer music from iPod to iTunes Mac. But you will basically be transferring only your purchases, which means that you can only transfer the files that you have officially purchased from the iTunes store. In other words, if you try to transfer music that you downloaded for free, it may not work, and in fact your music could become deleted in the process. On top of that, you have to deal with the iTunes application, which is inefficient, slow, and restrictive. 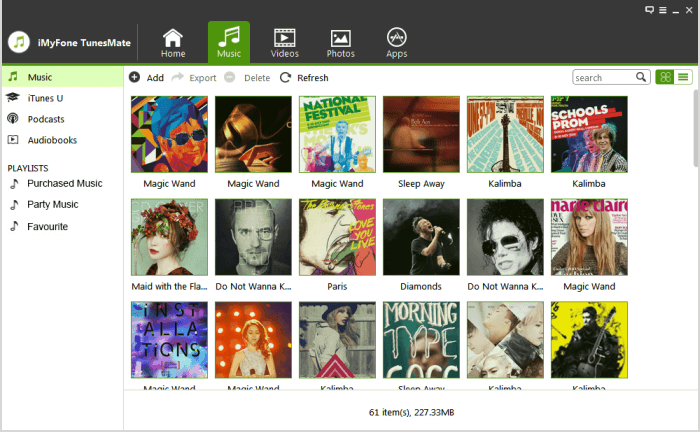 You can transfer one song at a time or manage your library as easily as you can with TunesMate. So if you want a better experience, definitely give TunesMate a try instead. Permanently erase all iOS data: WhatsApp, Viber, messages, photos, call history, note, etc, 100% unrecoverable! 1-click cleanup to reclaim massive free space & optimize performance of iPhone/iPad/iPod touch.